11 But Mary stood weeping outside the tomb. As she wept, she bent over to look into the tomb; 12 and she saw two angels in white, sitting where the body of Jesus had been lying, one at the head and the other at the feet. 13 They said to her, “Woman, why are you weeping?” She said to them, “They have taken away my Lord, and I do not know where they have laid him.” 14 When she had said this, she turned around and saw Jesus standing there, but she did not know that it was Jesus. 15 Jesus said to her, “Woman, why are you weeping? Whom are you looking for?” Supposing him to be the gardener, she said to him, “Sir, if you have carried him away, tell me where you have laid him, and I will take him away.” 16 Jesus said to her, “Mary!” She turned and said to him in Hebrew, “Rabbouni!” (which means Teacher). 17 Jesus said to her, “Do not hold on to me, because I have not yet ascended to the Father. But go to my brothers and say to them, ‘I am ascending to my Father and your Father, to my God and your God.’ ” 18 Mary Magdalene went and announced to the disciples, “I have seen the Lord”; and she told them that he had said these things to her. We celebrate today because of the hope in Christ. The hope in Christ. This statement is heavy with meaning. Each person has a very different experience linked to that statement, each different and each correct in its own right. For nearly two thousand years millions of people have experienced the hope of and in Christ in their daily lives. This hope comes through the life, ministry, death and resurrection of Christ. Every aspect of Jesus’ life is important. Each aspect can encourage, teach, give insight and hope from the Immaculate Conception through his sacrifice on the cross. Each and every moment in Jesus life that has been recorded and preserved in scripture provides us a glimpse into the intended path of humanity. Jesus God incarnate came to show us how to be human. Every aspect of Jesus’ life illuminates true humanity but that illumination does very little for us personally unless something supernatural could prove that the humanity Jesus proposed is greater than the humanity of the world. We celebrate today because Christ has risen from the grave. This is something that goes way beyond the mystery cults of ancient time, it goes beyond the pagan ritual that derive many of the ritualistic aspects of the secularized holiday of Easter, because those mysteries remain hopeless for us individually, yet there is a glimmer of truth from those pagan rites. Yes I say that there is a glimmer of truth in those pagan rites. You might ask how or why I can say such a thing, but I say that because those rites and myths are linked to something deep in the history of humanity, and its desire to find the divine. But each of those ancient rites fall short. They can give beautiful descriptions that explain life, but they fail to give true hope. Within the secular or pagan world leave humanity in the same place. Even the faith of the Hebrews leaves humanity in the pretty much the same positon. On a Friday the followers of Jesus watched as their teacher was hung on a cross. A teacher that they put all their hope into, a teacher that spoke about the kingdom of God, the kingdom that they all were sure was the kingdom of their ancestors. He told them that this kingdom was at hand, that it was all around them. That could only mean one thing in their minds, that this man was going to lead the revolution that would give them the freedom that they hoped for. Yet on a Friday their king hung from a tree, and the revolution they hoped for was dead. There was no kingdom, there was no hope. Because when things die everything is over. But then there is a glimmer of hope, every spring the dead earth begins to come to life again. The seasons change and maybe just maybe the next generation can find what humanity was looking for. On a Friday the king died, and they laid him in a tomb. They returned to the room they were staying and locked the doors, the only hope they had was that maybe as time went on the people would forget the teacher and maybe they would be able to return to their previous lifestyle and the next generation would see the new dawn of the kingdom. Saturday the tomb sat sealed with the king inside. The hope they once had was sealed in the earth left to return to the dust from which all life emerged. All hope was lost, it was sealed in the darkness with a sour aroma lingering in the air. The teaching remained, the life they learned to live would still important to them but there was no real power to drive them to remain. Thomas is the first to leave, the first to attempt to reintegrate into the life they previously knew, but he was not the only one to consider this. The women in the ranks prepared the necessary items to anoint the body to honor the one that changed their lives in so many ways. None regarded the time as a waste but each felt as if their lives had their feet knocked out from under them and they would once again have to rebuild. We know the sorrow and loss these people felt that day so long ago. We have each experienced the loss of a friend or loved one, we know how sharp and deep the shards of broken dreams can cut. We know this because that is life. We can wrap it up in fancy words and put names to the struggles: Hades, Poseidon, Thor, Odin, or a thousand other. We can form intricate word phrases that can pacify the pain or lessen the sting, but the fact of the matter is broken dreams and loss of life is the end. Death is the end. 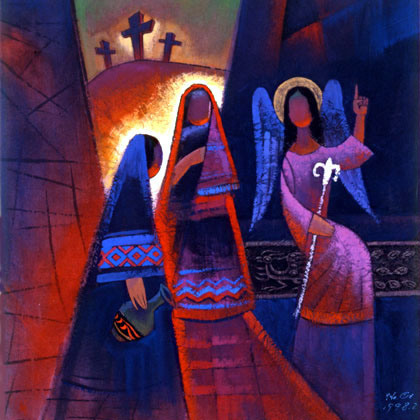 The women walk to the tomb carrying the item that will help with the grief but when they reach that tomb on a Sunday morning just as the rays of the sun begin to chase off the darkness of night something is amiss. The stone has been moved and the tomb is empty. Mary is afraid and she runs to tell the others. Confusion strikes everyone because it is true the stone was moved, yet the cloths they wrapped the body in remained. They are confused because who takes a body and leaves the grave clothes? Mary remains at the tomb on her knees weeping. Life could not get crueler. That is where many people sit. On their knees before an empty tomb. They know all the stories they have the right words to say in a situation yet their hope is empty. Those empty words and empty hopes are no better than any other religion in the world. They are nice words and stories that can help us cope but just empty words…unless. Mary is there weeping but hears a voice, “woman why are you weeping?” She looks up and see a couple of angel in the tomb. What had Mary witnessed in the past few years to not be afraid of a couple of angels? They ask her why she is crying, they do not tell her not to fear like every other encounter people have with these spiritual beings, and Mary answers them as if it is just normal conversation. Then she hears yet another voice asking the same question but this one comes from outside the tomb. She responds saying, “just tell me where you he is!” and then the voice calls her name. Immediately she knows the voice. It is not the voice of just anyone but the voice of Christ. This is where the secular platitudes of Easter remain empty and the power of Christ takes hold. There is power in the simple speaking of Mary’s name, because that voice came from the living not the dead. The impossible just became possible. The secular has empty theories and platitudes, they can look at nature, or the sun and moon and come up with elaborate stories that can comfort many, but the voice of someone that was once dead but lives fills the voids of the emptiness. Immediately Mary responds to Jesus and then moves to tell the others. A broken body spirit is now renewed and filled with something that can only be called hope. Though the future is still unclear and the path not totally known there is something that drives this woman that is beyond words…He Lives! We live on the other side of history. As time has passed darkness has fallen around us again in so many ways. The excitement of the risen Christ is often confused with the stories of the ancient mysteries. Again words are often filled with the emptiness of a world without hope. Even today many of us may find ourselves peering into a void of emptiness unable to see the miraculous around us. We have lost curiosity, we can no longer imagine, and we no longer dream dreams. Life has broken us to the point we can no longer see the difference between the Easter bunny and the Risen king! We look in the tomb and know it is empty but the emptiness does not give hope but only empty words. We are trapped in the emptiness, trapped somewhere between the secular and the spiritual unable to fully live because we are trapped between forgiveness and death. Jesus did not rise to keep us on our knees. Jesus did not rise to leave a void where life once was. Jesus did not rise to leave us trapped and bound somewhere between life and death. He rose to restore hope. He rose to prove to all that are willing to see that the life that He lived, is true life. He rose so that we would be able to see what the true kingdom of God is. The Kingdom of God is at hand. It is all around us. It is in the neighbor just over the fence, it is in the classroom at the university, it is at the coffee house and in the bars. The Kingdom of God is in the lives of everyone we meet. But are we able to see it? Are we able to see beyond the boundaries the world tries to place around us? Are we able to imagine the greatness, dream the dreams that will open the vastness of the kingdom to others, or see the miraculous that happens before our very eyes? The kingdom is only as vast as we let it be. The kingdom that we experience only extends as far as we will allow it to extend. I have asked several times over the past few years: “what would happen if we believed in the resurrection.” I ask it because how we respond to that question tells us how far the kingdom can expand around us. We may say we believe but there are levels of belief: the belief of knowledge, trust, and entrusting. Knowledge leaves us on our knees before an empty tomb. Trust allows us to rise to our feet. Entrusting causes us to run and live and active life within the kingdom. Often we find ourselves kneeling before the empty tomb unable to see, often we only see darkness before and around us. But Jesus the Risen King is calling our names. Will we join him in His life? Will we join him in his life of worship, prayer, and service? Will we love God, embrace the Holy Spirit and live the love of Jesus with others? He is Risen!